Welcome to a 1-day Rueda bootcamp Thurs Sep 5th 2019! The most repeated feedback last year was: BRING BACK THE PRE-CONGRESS! And guess what, we will! 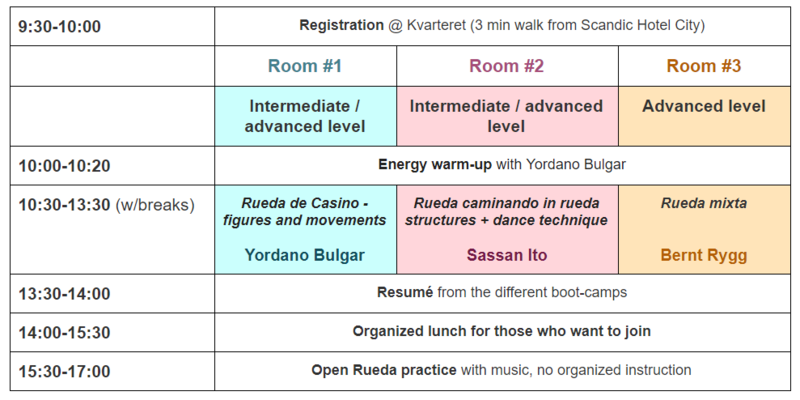 This 4 hrs bootcamp, including warm-up and resumé, allows us to go in-depth into the selected Rueda de Casino themes. Only 3 minutes walk from the Rueda Congress Hotel, Scandic Bergen City. Only single passes are sold for the PRE-congress. Until August 20th or sold out. Limited number of passes for the various workshops. Lunch in Bergen - optional, information will be given in the morning and table reservation organized. Lunch is paid individually and directly at the restaurant.